"Operation Musketeer" is perhaps better known in the West as "The Suez Crisis of 1956." It is also known in Israel as "The Sinai War." At the time, it appeared to be a preventive Israeli attack against Egypt, in response to an upsurge in fedayeen attacks that seemed to presage a resurgence of the state-to-state violence of the War of Independence, which had only ended five years earlier. In fact, the war seemed only to have degenerated into low-level conflict between Israel and her Arab neighbors, none of which had recognized an end to the war other than a temporary armistice in 1949. In the attack, which came in October, 1956, the Israeli Army demonstrated a mastery of the art of "blitzkrieg," with an Israeli parachute attack on the strategic Mitla Pass, and Israeli Shermans outmaneuvering Egyptian T-34s and Josef Stalin III tanks during a drive to the Suez Canal which was only blocked by the intervention of British and French forces which were bent on protecting the Suez Canal until they were forced to pull out by the United States following threats by Krushchev to attack the U.S. with nuclear-tipped rockets. So much for "public history." What has just been described was part of an elaborate cover story regarding an Anglo-French alliance with Israel to retake control of the Suez Canal after its nationalization by Gamal Abdel Nasser in 1955, with hope that the action would result in the destruction of Nasser, the leading Arab nationalist of his day, and thereby block penetration of the Middle East by the Soviet Union, which had the year previously concluded what amounted to an alliance with Nasser. Israel was in fact very nervous about the massive Soviet military aid to Egypt, which had seen over 100 MiG-15 and MiG-17 aircraft supplied to the air force, as well as several squadrons of Il-28 bombers that would be easily able to bomb Israel with virtual impunity, as well as the large-scale increase in armor in the form of Soviet tanks and artillery for the Egyptian Army. The Israelis were under no illusion as to who the ultimate target of all this hardware would be, but did not feel strong enough to undertake a preventive war on their own, particularly since they felt certain the Western powers would come down on the side of Arab oil. Nasser had risen to power in Egypt following the defeat by the Israelis in the 1948 War, sending the Western puppet King Farouk into exile in 1954. An anti-British anti-colonialist, Nasser dreamed of uniting the Arab world to reform the humiliations they had suffered over the previous 150 years by the Western European Powers. Following Nasser's expulsion of the British from the Canal Zone in 1955, British Prime Minister Anthony Eden (who it is now known was a Benzedrine addict at this point, which may well have clouded his judgment) was often heard to scream "I want this man murdered!" A confrontation was set in motion - it would be the final time that the British or the French would attempt to directly intervene in Middle Eastern affairs as they had during the heydays of their Empires. The French saw Nasser's pan-Arab nationalism as a dangerous ideology which threatened their North African empire, which was already convulsed in what would become the Algerian War of Independence. They saw striking Egypt as the best way to remove the major support the independence movement relied on. It was the French, operating on the old Arab saying that "the enemy of my enemy is my friend," who came up with the idea of allying with Israel, and creating the "cover" of an Israeli-Egyptian war as the pretext for intervention. The Israelis had no reason to love the British, who they had fought nearly as hard as they fought the Arabs for independence, and they did not trust the French when the first proposal was made. The French persisted, promising to provide air cover using the latest aircraft of the French Air Force to ward off possible attacks by the Il-28s. Gradually over the spring and summer of 1956, the Israelis came to see that the British and French were entirely serious in their desire to end Nasser's career; with the British and French as allies, the Israelis believed they could successfully attack the Egyptians before the armed forces were able to make good use of their great influx of Soviet equipment. In August, the agreement was made. That September, Egyptian Fedayeen guerrillas made several attacks on Israeli targets in the vicinity of the Gaza strip, which certainly provided adequate provocation for an Israeli strike. 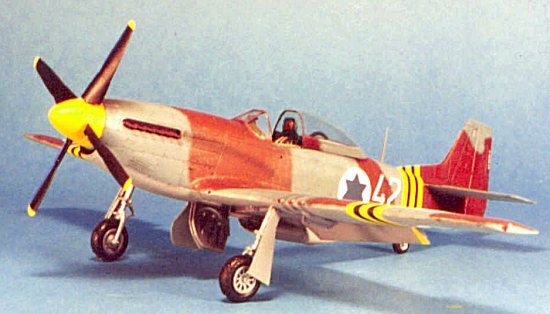 The Heyl Ha Avir - the air force of the Israeli Defense Forces - had first tried to obtain P-51 Mustangs as early as 1948, when leftovers from the Second World War littered airfields throughout Europe. With an official arms embargo from the West preventing acquisition of Western aircraft, the first fighter aircraft used by the Israelis came from Czechoslovakia (at the time newly Communist - in 1948 Stalin supported the Israelis as a way of destabilizing the West and their Arab clients). First was the Avia S-199, the thoroughly-awful Jumo-powered Bf-109, followed shortly by Spitfires that had formerly equipped the non-Communist Czech Air Force. Toward the end of the struggle, the first two F-51Ds appeared on operations. No one has ever detailed exactly where these aircraft came from, but I have heard they were purchased off airfields in France and Belgium, using money supplied by the Jewish gangster Mickey Cohen in Los Angeles; this may be apocryphal. At any rate, by the end of the War of Independence the Heyl Ha-Avir operated eight P-51s, which were augmented following the war by 25 P-51s obtained from Sweden in 1950, and a further 12 that came from the Swiss Air Force during the early 1950s. The Mustangs, operated by 101 Squadron, established air superiority over Israel until the arrival of Vampires in the Egyptian Air Force in 1953. 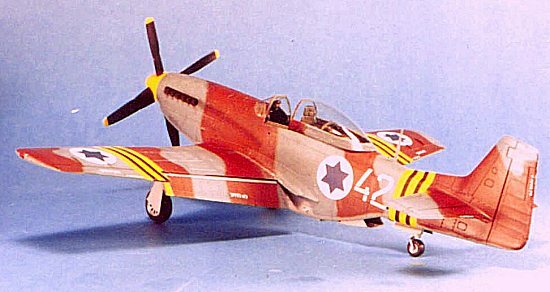 In the summer of 1956, the Barak (Scorpion) squadron was re-formed on P-51s after giving up their Spitfires. The squadron would have a special assignment in the coming conflict, involving some very low-level flying, which was practiced over the Negev in the ensuing months until the pilots felt comfortable at an altitude of under 50 feet. The Israeli Army was aware that the Egyptian forces in the Sinai depended on land-line communications, and that their communications security was laughable when it came to radio. If the Egyptians were forced to stop using their telephones and go on the air, it was likely they could become easily confused, as well as making it easier for the Israelis to find out what the enemy was about to do. Accomplishing this was the mission of the Barak Squadron. The mission was flown the night of D-1. Three flights of four P-51s took off, headed for the Sinai. Once airborne, they released a 100 foot cable attached to the tail of the airplane, and went down on the deck. The objective was to snag and pull down Egyptian telephone lines, destroying the communications system. No one knew if the airplanes could do the job, and many expected to lose most of them, with the phone wires wrapping around the tail surfaces, with resulting crashes. The Israelis have never spoken about losses in the mission, but unconfirmed sources state that all but one airplane returned safely, and the sole loss was due to anti-aircraft fire. With the Egyptian command and control system destroyed, the Israelis stood ready to attack. I doubt there is a modeler who would disagree with the statement that the Tamiya P-51D Mustang kit is the best ever done by any company of this famous airplane. Not only is it accurate, it is also so well-engineered that it would take a modeler who was actively opposed to making the kit correctly to end up with anything less than a well-built model. It is particularly nice that the kit is the only one of the P-51D that comes with dropped flaps; almost all P-51D Mustangs sit in the parked position with the flaps down to avoid undue pressure on the hydraulic system. The one area where the kit is less than completely superb is the cockpit. Tamiya has been well known for simplifying cockpits, and this is one of them. While the cockpit is acceptable when completed, it cries out for more detail. Fortunately, True Details made one of their very best resin products when they made the P-51D cockpit, which is available from Squadron Mail Order for US$4.95. Aires has also made a resin cockpit, which is also available from Squadron. I personally like the TD version, since it is virtually impossible to mess it up trying to apply small fiddly resin parts - there are none! The resulting cockpit looks absolutely right. Another nice bit to add to this kit is the Squadron vacuform canopy that was made specifically for the Tamiya kit. It too is beautifully molded, and done in two parts; this is particularly nice, since cutting the canopy and windscreen apart on a one-piece canopy can be problematic. These parts are done so well it is not difficult to build with the canopy closed should one so desire; after a dip in Future, the canopy is clear as a bell and everything inside would be very visible. There is nothing new to say about building the Tamiya kit, other than it virtually snaps together. I put my time into painting and finishing the True Details cockpit. It has been believed that P-51Ds all had interior green cockpits, though there has been some recent information that they might also have been painted Dull Dark Green, depending on availability of paint stocks. Just for a change, I decided this cockpit would be one of those. I airbrushed Gunze-Sanyo H-302 Semi-Gloss Green FS34092, then used Tamiya semi-gloss black for instrument panels and other "black boxes." The seat pad was done in olive drab, and the seat belts in Gunze-Sanyo "Sail Color." I used thinned Tamiya "Smoke" as a wash to pop out detail. With the kit's molded-on cockpit detail sanded off the fuselage halves, the cockpit fit easily, and the model was quickly assembled. 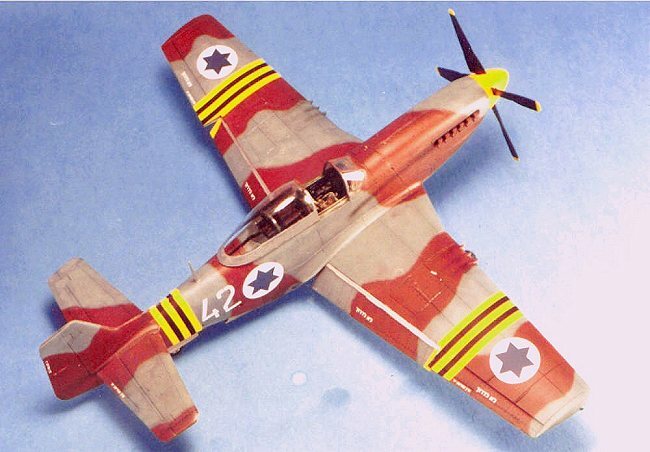 The Israelis began camouflaging their aircraft in the summer of 1956, in a disruptive upper surface scheme of blue-gray and reddish-brown, with light grey lower surfaces. I used Gunze-Sanyo H-337 "Grayish Blue", Tamiya XF-64 "Red Brown" and Tamiya XF-19 "Sky Grey," after pre-shading the model with flat black. No two of these airplanes had a similar scheme. Fortunately, the Isradecals instruction sheet provided a camouflage pattern for this airplane, with both sides and an upper plan view. The spinner was painted Tamiya XF-3 "Flat Yellow." As I did each color of the upper surface camouflage, I lightened the paint in the air brush cup with white, and went back over the various areas, to create a faded paint effect, which would be expected for an airplane operating in a desert environment. The Isradecals sheet provides markings for three 1956 aircraft, and four pre-1956 Mustangs. The yellow/black Operation Musketeer ID stripes are provided as decals for this particular airplane. The decals are high-quality and go down with no problems with a light coat of Micro-Sol. I airbrushed exhaust and gun stains, and drybrushed Testor's ModelMaster Metalizer Aluminum to get scuffed areas on the wing and chipped panel lines around the engine and gun bays, then gave the model several coats of "Flat Future" (Future mixed 70-30 with Tamiya "Flat Base") to dull down the overall finish, taking it dead flat on the upper wings, horizontal stabilizer and upper areas of the fuselage most exposed to the unrelenting sun. The end result is a Mustang that looks completely different from all the other bright silver Mustangs in my collection. If you have the kit in your to-do pile, getting hold of these decals is an opportunity to do a very interesting model.